This game will help you discover the sensational stories and tantalizing trivia behind the music. What was the Beatles' last album? Which Disney series made Miley Cyrus famous? From The Beatles to Björk, from vinyl to streaming, from bluegrass to hip-hop, this game will help you discover the sensational stories and tantalizing trivia behind the music. It features 400 multiple choice questions covering the musical multiverse, with answers adding or subtracting IQ points from your score. This two-round format favors learning—the first tests your knowledge, while the second tests your memory, giving novices a chance to challenge long-time music nerds. 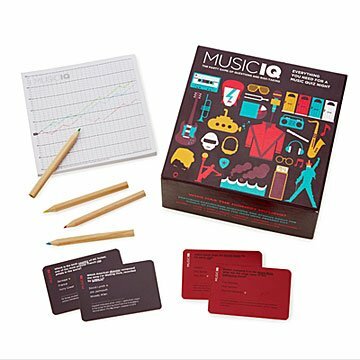 It's a great gift for music and trivia lovers, whatever their favorite groove. Made in Poland. Includes: (200) double sided cards, (1) scorepad, (4) colored pencils, (1) rules booklet. Features content from the 1960s until present day. This game was a hit at Chritmas with the whole family! Really loved the different and plentiful cards...they were a challenge but had multiple choice answers which helped and made it enjoyable! Great Christmas gift for my dad because he loves music trivia. It's great to have games the whole family can play together! Fun, but must know older musicians. A lot of difficult music-related questions, but the game is set up to allow the team to choose to answer with or without multiple choice which makes it a bit easier. Game was fun with older (over 50) crowd, but has a lot of pre-90's music questions. Wouldn't play it in a group of 20-something year-olds. Cool looking box but really basic and not challenging game.